I met Annie this afternoon immediately after she arrived to the bivouac. Her position after SS1 was no.41. She said she wasn’t very happy with herself. She mentioned she did too many mistakes. Many People cheering, many 90 degrees fast turns. Because she was late this morning at the start, and lost some additional time refueling, she got caught by the dust cloud of the competitors. “Tomorrow is another day” she said. I could see the frustration on her face, but I’m sure tomorrow she will be happier. A chaotic morning. Short of time on the liasion because of trouble at the fuel station. So I started as 110 instead of 93. I overtook many riders in all the dust. It’ was very dangerous, couldn’t see anything. Many others had accidents. But I had a good flow and the engine is strong. Several top bikers damaged the tyres, but I had no problems. Though the oil pressure worried me. Luckily I found the reason: a hose was squeezed, so I fixed it. A very good rally start: finished as 41! This entry was posted in 2009, Mechanical problems, Success and tagged Annie Seel, Dakar 2009, motorsport. Rally Dakar 2009, originally uploaded by anniedakar. Annie Seel, originally uploaded by anniedakar. I’m very excited and ready to go. My 1st day of the year was a hard one. I had to exchange the exhaust of the Bike, as it was too noisy, and I realized I had my rally driving license still in Sweden in my Fax! This entry was posted in 2009 and tagged Administrative Checks, Dakar 2009, Podium. Hello Folks! My Blog for Dakar 2009 is ready! Finally I managed to create a Blog, which I will use on a daily basis for communicating with everyone who is interested in following my adventures in Argentina. Follow me during the race! I just landed in Buenos Aires with Stefano Levi and Tina Meier on the same flight, and am very excited about the next days. 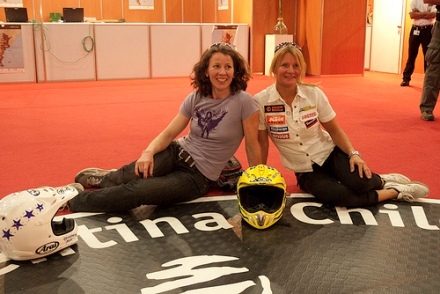 This entry was posted in 2009 and tagged Annie Seel, Dakar 2009. This entry was posted in 2009, Bike & equipment, Preparing.